Since today is Halloween, we decided to have a look through the College collections to see what spooky items we could find. We considered featuring a pickled half-head, or relating the history of witches in the West of Scotland* but decided instead to use this opportunity to highlight a wonderful (but often overlooked) painting from the art collection by former Fellow O. H. Mavor. 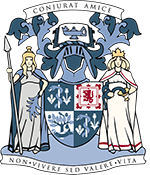 O. H. Mavor studied medicine at Glasgow University, became a Fellow of the Royal Faculty of Physicians and Surgeons of Glasgow, and worked as a general practitioner. His talents were not, however, limited to medicine. Indeed, he was perhaps best known for his plays, written under the pseudonym James Bridie (a name he arrived at by combining his grandfather’s first name and grandmother’s maiden name). As well as holding copies of a number of his plays, the College library holds copies of Mavor’s caricatures of some of the most eminent medical practitioners in Glasgow the early 20th century. These cartoon drawings demonstrated his wit and wry sense of humour, and Mavor was always able to succinctly capture the background and personality of his friends and colleagues in the medical profession. 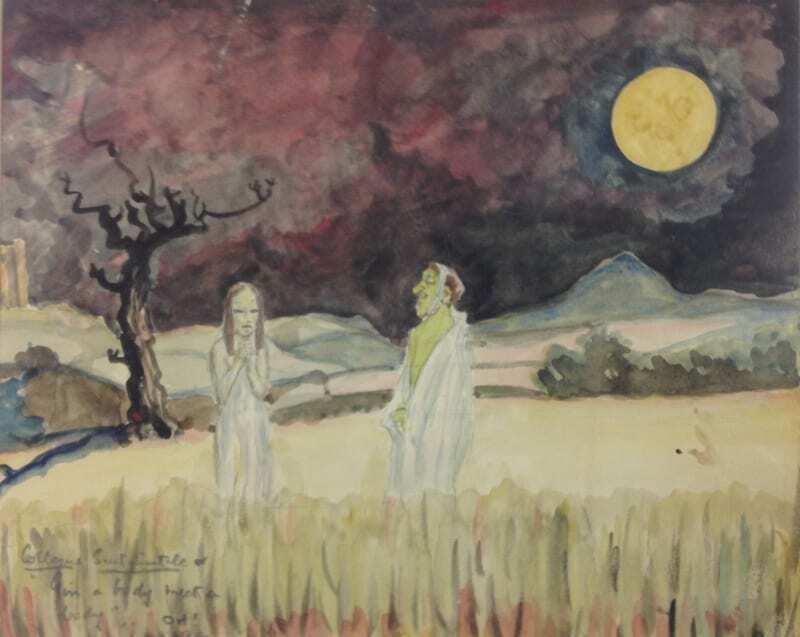 This watercolour painting of two ghostly figures in a field is signed “O.H. ’39” by Osborne Henry Mavor and is titled Colloque Sentimentale, or “Gin a body, meet a body”. It borrows its title from the French poem by Paul Verlaine and takes a line from Robert Burns’ poem, Comin’ Thro’ the Rye. We decided to highlight this painting because the work is so unlike the relatively light-hearted sketches that Mavor usually produced. As the title suggests, Mavor was obviously influenced by the poetry of Verlaine and Burns, and the painting has a certain eerie, almost ethereal quality. The two figures in the field are very different to the characters in the rest of Mavor’s drawings. No wry humour and subtle in-jokes here. We think everything about this painting makes it perfect for Halloween, from the landscape and the colour of the sky to the posture and expressions of the two figures. * If you were particularly looking forward to some witchcraft or pickled body parts, don’t fret – we’ll probably blog about them another time!